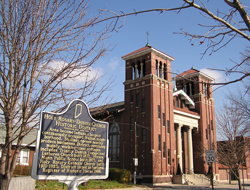 Holy Rosary—Danish Church Historic District illustrates how close enclaves of European immigrants settled Indianapolis in the late 1800s. 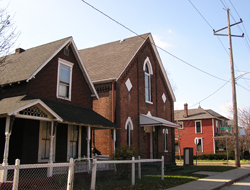 These groups left their mark in churches and dense areas of modest vernacular cottages on the near south side of Indianapolis. This pocket of small frame cottages, brick commercial buildings, and churches lies south of downtown, adjacent to the sprawling Eli Lilly corporate headquarters. At first home to a mix of ethnic groups in the mid-19th century, two took precedence by the 1890s. Italian families constituted 90 percent of the population of the area by 1910. Most were involved in the produce trade and many family names survive as produce companies today. A good place to begin touring the district is the former Danish Church at 701 E. McCarty. Indianapolis once had many vernacular gable-front Gothic Revival chapels like this one dating from 1872 with a Danish inscription in the gable end. Further south on Noble or Greer are typical vernacular cottages with milled trim work and simple wood porches with lathe-turned posts. Horace Mann School #13 is at the southern end of the district, at 714 Buchanan Street. Indianapolis architect Edwin May designed this two story brick Italianate schoolhouse, completed in 1873. It now houses condominiums. Holy Rosary Catholic Church is at the north end of the district, at 520 Stevens Street. Built from 1910 to 1911, architects Kopf & Wooling’s Renaissance-flavored design features twin campaniles, recessed Corinthian columns, and terra cotta tile roofing. Initially, the first architect, George Bedell, had planned a central dome and domed towers for the building. Bedell’s design only rose to the upper foundation walls before the parish switched architects. I-65/70 and South East St. roughly bounded by Virginia Ave. to the northeast, Interstate 65/70 to the east and south and South East St. to the west. Private homes in the district are not open to the public. The Italian Street Festival takes place in the early summer. See the Italian Heritage Society of Indiana website for exact dates and times. INDYGO bus line from downtown: #22 Shelby, disembark at South and Virginia; walk south on Virginia to district.